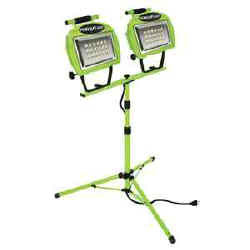 Using cutting-edge LED technology, this light comes with (48) surface-mounted, high-intensity LED's (24 per head). There's also a telescoping tripod (42-68") and sled base with a quick release. And it's sturdy, thanks to a die-cast housing and non-skid feet on a steel H-frame base. A weatherproof On/Off switch, u-shaped comfort-grip handle, and directional control knobs are standard too. 1558 lumens (779 per head). 18/3 ga, 5' cord. UL listed.